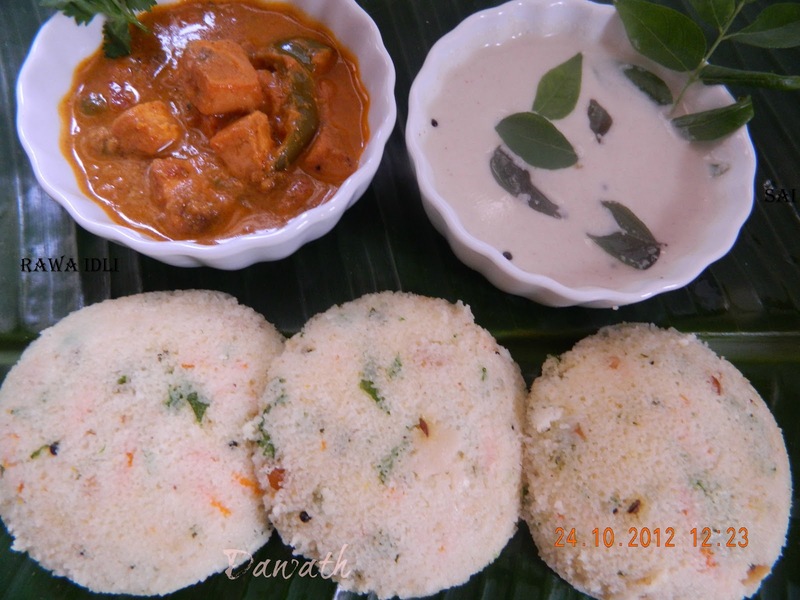 Rawa idli is a South Indian breakfast dish made with fine semolina.It is a specialty of Karnataka.Rawa idli was my childhood favorite breakfast dish.We used to enjoy eating it with garam masala gravies.This recipe is of my sister in law Santoshi who cooks very good South Indian delicacies. Dry roast the suji until you get a nice aroma. Transfer into a vessel and cool it completely. Add the beaten curds, salt, grated carrot, green peas, coriander leaves, grated coconut. Heat oil/ghee add mustard seeds, when it splutters add chana dal, urad dal, curry leaves, green chillies and cashews. Temper this to the above suji mixture. Add soda powder just when you are ready to steam idli’s and beat it well. Add water in the the idli cooker,heat the vessel, grease the idli plates with a drop of oil or ghee, add the batter and steam for 15-20 minutes. Off the flame and open the lid of the idli cooker once done and remove the idli stand out. Allow it to stand for 3-4 minutes and then unmould the idlies with the help of a butter knife. Add a dash of ghee on the top of the idli. Serve it with chutney or gravy. Tips—Add water to the batter to adjust the consistency.